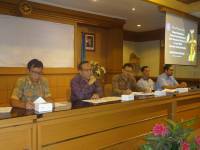 Jimbaran - Thursday, (28/06/2018), in the Nation Room Rectorate Building Bukit Jimbaran Campus, Human Resources Division (SDM), General Bureau, Udayana University held Workshop "Procedure of Giving Leave, Procedure of Preparation SKP With Cascading Method For Staff at Udayana University "Workshop was opened by the Head of Public Bureau, Drs Ketut Amoga Sidi by presenting a resource person from the Central Personnel Agency Office of Drs. Rahmat AS, MM (Head of Sub Directorate of Evaluation and Monitoring of Performance Assessment and Standards of Employee Performance of ASN) and Agus Praptana, S.Sos., M.AP (Head of Subdirectorate of Promotion and Position Other than Senior High Leader, Senior High Leader and Main Functional Position). Head of Human Resources Division Unud, Nyoman Sumayadnya convey the purpose and purpose of this workshop is to improve the understanding of the procedure of giving leave for civil servants, equation of perception of the Regulation of Personnel of the Republic of Indonesia No. 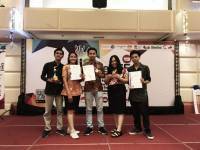 24 of 2017 and Government Regulation No. 46 of 2011 and provide a governance- how to arrange employee job target with cascading method. 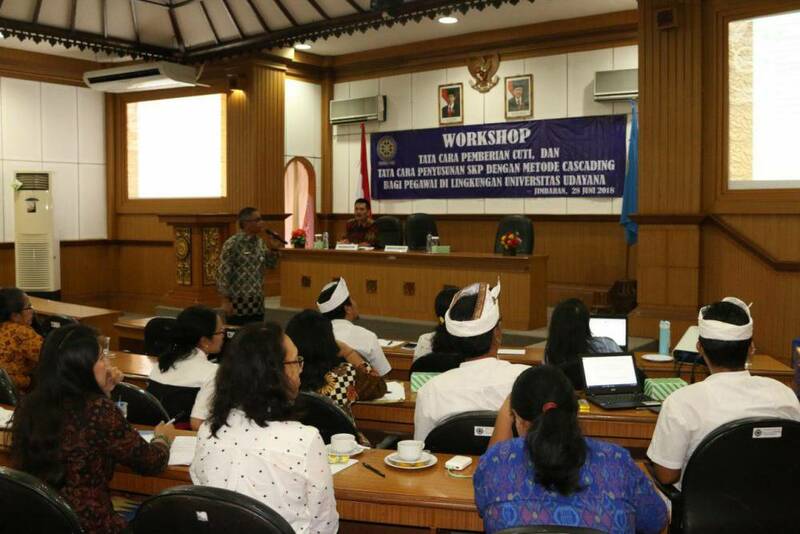 The workshop was attended by Vice Deans II of Faculty, faculty representatives, UPT representatives, USDI, Kooprodi and representatives from Bali State Polytechnic. Head of HR hopes this activity can be useful and provide understanding in terms of technical giving of leave and preparation of Employee Work Objectives. Head of Sub Directorate of Procurement and KepgaBadan Kepegawaian Negara in the presentation of the material explaining about the legal basis of giving leave is referring to Government Regulation No. 11 of 2017 on the management of civil servants. In this case the definition of leave is a condition of absenteeism permitted within a certain period and the Official Authorized to Give Leave (PYBMC) is a KDP or official who gets a partial delegation of authority from KDP to provide leave. Types of Annual Leave (CT), Cut Off (CB), Sick Leave (CS), Maternity Leave (CM), Cause Leaveover (CAP), Crime Leave (CBer) and Leave Out of State Expenditure (CLTN ). Mechanisms and conditions in the filing of leave refer to the rules that have been set. Besides, there are also other provisions, among others, civil servants who are using the rights to CT, CB, CAP and Cber can be recalled to work if the interests of the service urgent. In the case of civil servants being recalled to work, the period of unpaid leave remains the right of civil servants. The right to CT, CB, CS, CM, CAP to be run abroad, may only be provided by KDP. In the urgent matters, so that civil servants can not wait for the decision of KDP, the highest official in place of civil servants may grant temporary written permission to exercise the right to leave. Provision of temporary permit must be immediately notified to the CO. KDP after receiving notice gives the right to leave to civil servants. Provisions concerning CS, CM, CAP, apply mutatis mutandis to Prospective civil servants. Civil servants who are running CLTN at the time of enactment of PP 11/2017, after completion of running CLTN must report themselves in writing to the parent agency no later than 1 month after completion of running CLTN. Civil servants who have finished running CLTN and have been reactivated as civil servants, may submit CT if it has been working continuously for at least 1 year since reactivated as civil servant. Other income, among others, in the form of performance allowances, income remuneration benefits paid to civil servants who are running the leave in accordance with the provisions of legislation.